These steps activate jobs to allow people to signup for them. You will need to perform these steps for each meet in which you want to allow job signups. Click Job Signup under desired meet. 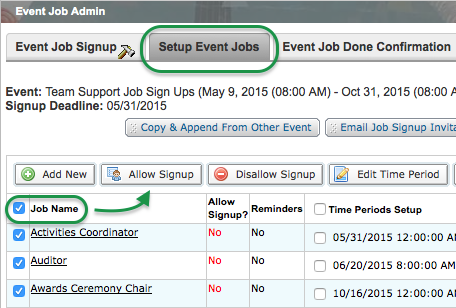 Click Setup Event Jobs tab. Select all jobs (click check box by "Job Name" column header), or check the boxes of the jobs you want to activate. Click Allow Signup and click OK to verify.